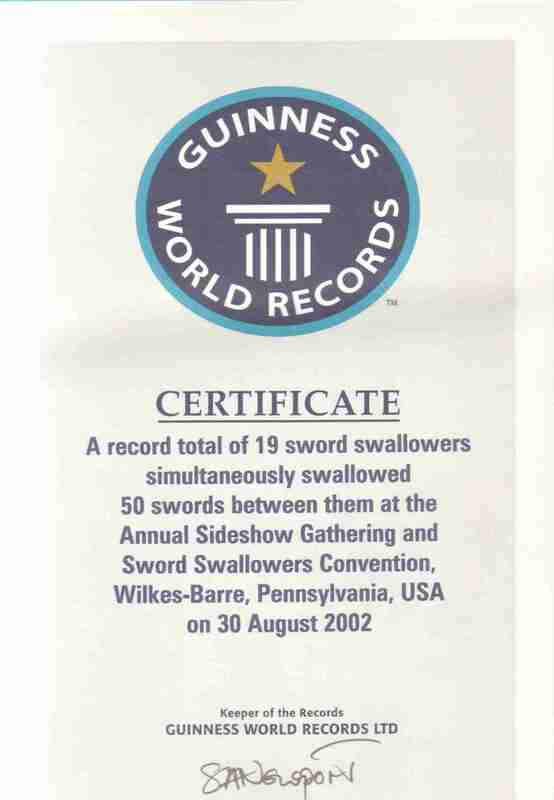 Most Sword Swallowers Swallowing Swords Simultaneously 19 Sword Swallowers 19 Sword Swallowers History was made on Friday, Aug 30, 2002 when 19 Sword Swallowers swallowed swords simultaneously at the 2002 Sword Swallowers Convention in Wilkes-Barre, PA USA. This record was certified an official *Guinness World Record™ in 2004. Most Swords Swallowed Simultaneously 50 Swords 19 Sword Swallowers On Friday, Aug 30, 2002 19 Sword Swallowers set a new world record by swallowing 50 swords at the same time (breaking the previous record of 46 swords) at the 2002 Sword Swallowers Convention in Wilkes-Barre, PA USA. This record was certified an official *Guinness World Record™ in 2004. 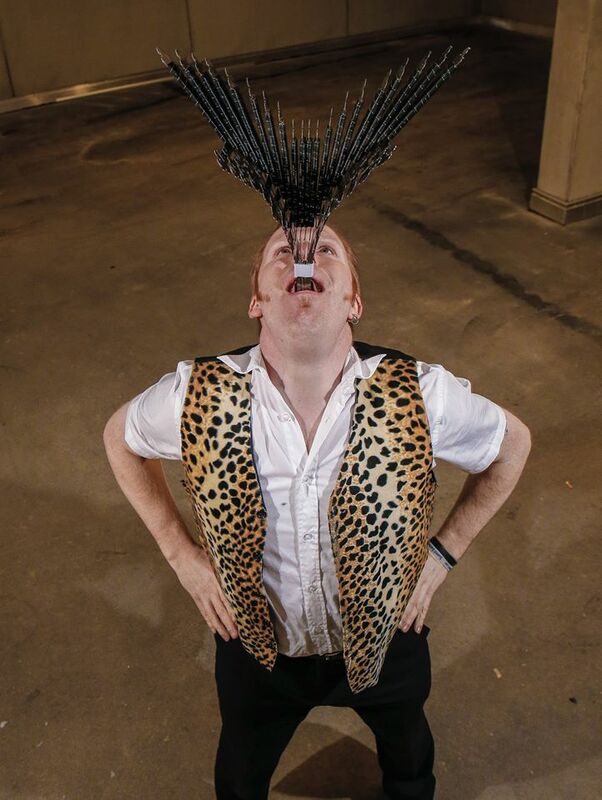 On February 20, 2015, German sword swallower Franz Huber swallowed 21 swords at once with blades in compliance with SSAI and Guinness requirements, measuring 27 inches long (68 cm) with blades 20.25 inches (51 cm) long by .5 inches wide by 1 mm thick in Garching an der Alz, Bavaria Gemany. (photo). On Saturday, February 28, 2015, Franz Huber swallowed 22 swords at once measuring 27 inches long (68 cm) with blades 20.25 inches (51 cm) long by 1 mm thick before a live audience for World Sword Swallower's Day 2015 at Ripley's Believe It or Not Odditorium in Orlando Florida USA. 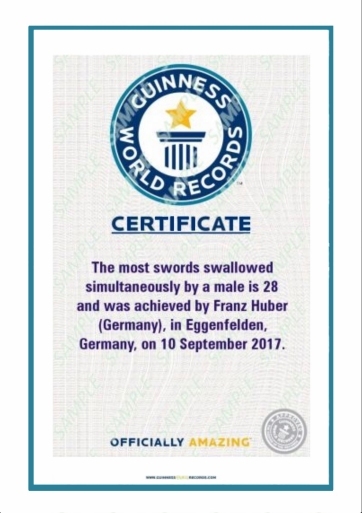 On 10 September, 2017, Franz Huber broke the standing Guinness World Record by swallowing 28 swords at once in Eggenfelden Germany (certificate video). Matty Blade Henshaw swallowed 14 60 cm long swords regularly in his shows from April 5, 2000 to June 2004 in Australia. On May 29, 2010, Henshaw swallowed 21 swords 13 mm wide and 45 cm long at the Perth Tattoo Expo in Perth Australia to set his own personal record and the new Australian record. Lucky Ball set his personal record by swallowing 16 swords at once in 1937. Johnny Fox swallowed 16 swords on the Jonathan Winters' Comedy Magic Special in the 1980s. Dai Andrews swallows 14 swords at the same time regularly in his show. On World Sword Swallower's Day 2012, Chris Steele swallowed 9 swords at once at Ripley's Believe It or Not St. Augustine, FL on February 25, 2012, and again on World Sword Swallower's Day 2015 on February 28, 2015. "Champion Sword Swallower" Edith Clifford regularly swallowed 16, 20 and 24 swords at once between 1899-1905. Harry Houdini saw her perform with Ringling Brothers Circus in 1919, and was so impressed with her abillities that he dedicated a good portion of his book "Miracle Mongers and their Methords" to Clifford. Clifford may have continued to swallow multiple swords up until 1920, when she retired from sword swallowing. Capt. Don Leslie Alex Lang held the * Guinness World Record™ for swallowing four 27-inch long swords at one time in the 1960s. Alex Linton On 10 September, 2017, in Eggenfelden Germany, Franz Huber set the current Guinness World Record by swallowing 28 swords at once (certificate video). On September 3, 2005 Red Stuart swallowed 25 swords at once with blades measuring at least 18" long x 1/2" in width at the 2005 SSAI Convention in Wilkes-Barre, PA (video) (certified an official Guinness World Record™). On June 13, 2012, sword swallower Dan Meyer swallowed 21 swords at once to break his previous record of swallowing 15 swords in Indianapolis, Indiana, USA. Chayne Hultgren, the Space Cowboy of Australia held the official men's * Guinness World Record™ for swallowing 17 swords at once at Calder Park in Melbourne, Australia on March 28, 2008, which he broke by swallowing 18 swords at once on February 7, 2010 in Sydney, Australia. Matty Blade (Matthew Henshaw) of Australia held the men's * Guinness World Record™ for swallowing 14 60 cm. swords 2.6 mm thick weighing 4.5 kg at the Fremantle Busker's Festival on April 5-6, 2000. Henshaw swallowed 14 60 cm. swords regularly in his shows from April 5, 2000 to June 2004. On May 29, 2010, Henshaw swallowed 21 swords 13mm-wide and 45cm-long at the Perth Tattoo Expo in Perth Australia to set his own personal record and the new Australian record. Natasha Veruschka received the official women's * Guinness World Record™ for swallowing 13 swords at once at the 3rd Annual Sword Swallowers Convention in Wilkes-Barre, PA on Sept 3, 2004 (video). Verushka later broke this record for an official Guinness World Record™ when she swallowed 14 swords on the set of "Lo Show Dei Record" in Rome, Italy on April 1, 2010. Dan Meyer swallowed 7 swords at once on Sept 2-3, 2005 which was certified as part of an official Guinness World Record™ in Wilkes-Barre, Pennsylvania, USA. Amy Saunders held the women's * Guinness World Record™ for swallowing 5 blades at one time in London in 1999. Amy later broke her own Guinness world record by swallowing 6 swords on the set of El Show de los Records, Madrid, Spain on 27 November 2001. (video) Saunders later set a new women's Guinness World Record by swallowing 7 swords at once in London on September 11, 2004 on the Guinness World Records anniversary episode. Lady Sandra Reed> held the * Guinness World Record™ in 1975-1977 for swallowing 5 swords at once. Alex Linton held the * Guinness World Record™ for swallowing four 27-inch long swords at one time in the 1950s. Lady Sandra Natasha Veruschka currently holds the official women's * Guinness World Record for swallowing 13 swords at once at the 3rd Annual Sword Swallowers Convention in Wilkes-Barre, PA on Sept 3, 2004. Veruschka later broke this record for an official Guinness World Record™ when she swallowed 14 swords on the set of "Lo Show Dei Record" in Rome, Italy on April 1, 2010. Amy Saunders held the * Guinness World Record for a woman by swallowing 5 swords in London on April 28, 1999. According to Guinness, the official Guinness record for the most 35.5-53 cm (14-21 in) swords swallowed by a female was 6 by Amy Saunders on the set of El Show de los Records, Madrid, Spain on 27 November 2001. Amy later broke her own personal record and set a new Guinness World Record by swallowing 7 swords in London on September 11, 2004 on the Guinness World Records anniversary episode. Lady Sandra Reed held the * Guinness World Record in 1975-1977 for swallowing 5 swords at one time. On September 3, 2005 at the 2005 SSAI Convention in Wilkes-Barre, PA USA, Red Stuart swallowed 25 swords at once with blades measuring at least 18" long x 1/2" in width (certified an official Guinness World Record™). On Saturday, April 19, 2008, Red Stuart broke his own record by swallowing 34 swords with blades measuring at least 18" long x 1/2" in width at the 2008 Philadelphia Tattoo Convention in the Sheraton Hotel, Philadelphia, PA USA. On Saturday, February 28, 2009, in honor of World Sword Swallower's Day 2009, Red Stuart broke his previous world records by swallowing a total of 52 swords at once with blades measuring 18" long by 1/2" wide at Ripley's Believe It or Not in Atlantic City, NJ USA. On March 28, 2015, Dan Meyer swallowed 29 swords at once measuring 27 inches (68 cm) long with blades measuring 20.25 inches long by .5 inches wide by 1 mm thick at Ripley's Believe It or Not St. Augustine, Florida, USA. In 2011, Kishan Valaiah Ayula of Telangana Andhra Pradesh India was presented the Guinness World Record for swallowing 22 swords at once. In 2012, Kishan broke his record by swallowing 23 swords at once. On February 20, 2015, German sword swallower Franz Huber swallowed 21 swords at once measuring 27 inches long (68 cm) with blades 20.25 inches (51 cm) long by 1 mm thick in Garching an der Alz, Bavaria Gemany. (photo 20 swords). On Saturday, February 28, 2015, Franz Huber swallowed 22 swords at once measuring 27 inches long (68 cm) with blades 20.25 inches (51 cm) long by 1 mm thick before a live audience for World Sword Swallower's Day 2015 at Ripley's Believe It or Not Odditorium in Orlando Florida, USA. Australian sword swallower Matty Blade Henshaw swallowed 14 60 cm. swords regularly in his shows from April 5, 2000 to June 2004. On May 29, 2010, Henshaw swallowed 21 swords 13mm-wide and 45cm-long at the Perth Tattoo Expo in Perth Australia to set his own personal record and the new Australian record. On June 13, 2011, sword swallower Dan Meyer swallowed 21 swords at once in Indianapolis, Indiana to break his previous record of swallowing 15 swords at once on November 14, 2010 at the Bruce Museum, Greenwich, CT USA. Chayne Hultgren, the Space Cowboy swallowed 17 swords at Calder Park in Melbourne, Australia on March 28, 2008. Johnny Fox swallowed 16 swords on the Jonathan Winters' Comedy Magic Special in the 1980s in USA. Dai Andrews swallows 14 at the same time in his shows at the same time. Amy Saunders swallowed 5 swords in London in 1999. According to Guinness World Records, the most 35.5-53 cm (14-21 in) swords swallowed by a female was 6 by Amy Saunders on the set of El Show de los Records, Madrid, Spain on 27 November 2001. Amy later broke her own personal record and set a new Guinness World Record by swallowing 7 swords at once in London on September 11, 2004 on the Guinness World Records anniversary episode. On August 6, 2015, Huber broke the record by swallowing 13 swords at once measuring 27 inches (68 cm) long with 20.25 inch (51 cm) long blades by 1 mm thick and twisting them 180 degrees on a live performance of Germany's Got Talent's Das SuperTalent in Essen, Germany. On February 25, 2017, for World Sword Swallower's Day 2017, Capt. Chris Steele swallowed 13 swords and twisted them 180 degrees before a live audience at Ripley's Odditorium St. Augustine, FL. On February 25, 2017, for World Sword Swallower's Day 2017, Franz Huber swallowed 14 swords and twisted them 180 degrees before a live audience at Ripley's Odditorium Amsterdam Netherlands. On July 2, 2014, sword swallower Brianna Belladonna swallowed a 24.75 inch sword with 19 inch blade and rotated it in a 180 degree twist, and she has been performing this feat in her act ever since. Canadian sword swallower Ryan Stock swallowed a curved sword which he rotated 180 degrees from his right side to his left side. Sword swallower Brett Loudermilk swallowed a curved sword which he rotated 180 degrees from his right side to his left side. 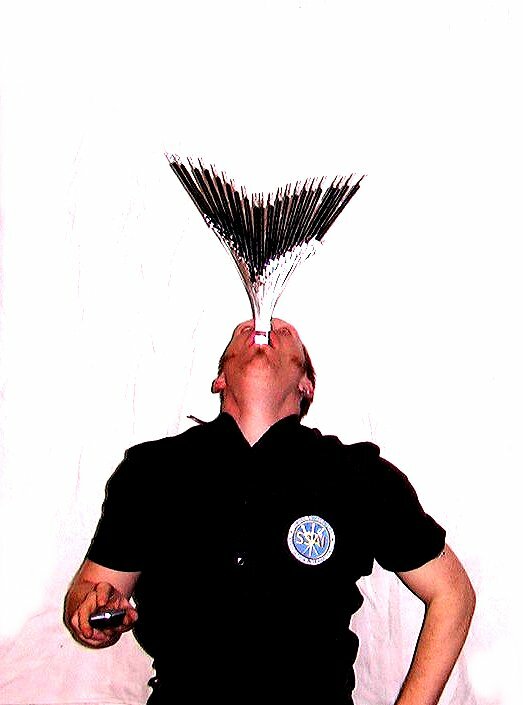 270 shows Matty Blade Henshaw In 2003, Matty Blade Henshaw swallowed 14 swords in 270 shows within 365 days for a total of 3782 swords swallowed in one year. Gordo Gamsby (Australia) The sword known as "The Sword of Swords" has been swallowed by at least 40 of the world's known sword swallowers. The sword was made by Thomas Blackthorne (UK/IT) in 1994 as a symbolic icon to link the otherwise solitary and disparate sword-swallower community. The "Sword of Swords" was swallowed in September 2002 at the first Sword Swallowers Association International international Sword Swallower's Convention by sword swallowers Thomas Blackthorne, Dai Andrews, Roderick Russell, Dan Meyer, Damien Blade, Johnny Fox, Ses Carny, Frack, Malakai, George the Giant, Peter Pokus, Red Stuart, Lizard Man, Bill Berry, Mr. Pennygaff, The Great Fredini, Jewels, Natasha Veruschka, Todd Robbins, Tim Cridland, and Tyler Fyre The Sword of Swords was also swallowed in 2002 by Miss Behave and Wasp Boy. The Sword of Swords was then swallowed by Lucky Diamond Rich on September 2, 2003, the day he became the world's most tattooed man. It was also swallowed in 2003 by Claudio Borghi. In 2004, it was swallowed by sword swallower Rupert. In 2005 it was swallowed by David Straitjacket. In 2006, the sword was swallowed by Space Cowboy, Elena Sellentin, Marco Cardona, Helmut Hannibal Helmurto. In 2007, it was swallowed by Captain Frodo, Gordo Gamsby. The Sword of Swords has since been certified as an official Guinness World Record™. Finland 63 cm / 25 inches Yrj� Lehvonen Yrj� Lehvonen was the best-known sword swallower in Finland, performing from around 1950 into the 1960's. In 1964 Lehvonen swallowed a 63 centimeter long sword to the hilt, which according to Kotiposti magazine was a world record at the time in Finland. Australia 72 cm / 28.4 inches Space Cowboy Due to an internal deformation medically known as congenital division of the stomach, the lower half of Chayne's stomach has been replicated and sits lower than the average human stomach, allowing Chayne to swallow longer swords. USA 83.82 cm / 33 inches George The Giant At 7' 3" tall, George the Giant has a height advantage and holds the world record for swallowing the longest sword by swallowing a sword with a 33" long blade. Curved Sword 120 degrees Dai Andrews Dai Andrews set a new world record for the "Largest curve in a sword swallowed" by swallowing a sword that was curved 120 degrees from point to hilt on September 12, 2009 at Pimlico Race course in Baltimore, MD USA. The angle of the sword was measured manually by protractor and digitally by Auto-CAD. Jack Hammer Jack Hammer Thomas Blackthorne Thomas Blackthorne swallows a running jackhammer. Dan Meyer swallowed a sword with 19 inch long blade and the used it to lift 5 liters of water in a bucket with combined weight of 5.14 kilograms (11.3 lbs) which he held for 5.63 seconds to set a new Assist World Record on February 5, 2012 in Hyderabad India. (video) This record was witnessed, adjudicated, and verified by a team of 5 official adjudicators from Global Assist World Records India and certified an official Global Assist World Record before a live audience of over 10,000 people attending CityFest Hyderabad at Wesley Degree College in Secunderabad, Andhra Pradesh, India. This record was also later certified as an official Record Setter World Record. Matty Blade Henshaw is listed in the 2007 * Guinness World Record Book™ for swallowing a sword with the heaviest weight of 20.1 kilograms (44 lb 4.96 oz) attached to the hilt for five seconds. Thomas Blackthorne The heaviest object sword-swallowed is a Dewalt D25980 demolition hammer weighing 38kg (83lb 12 oz).Thomas Blackthorne (Italy) swallowed the 25mm (1 inch) thick drill bit, then held the full weight of the hammer and bit for over 3 seconds, on the set of�"Guinness World Records™ - Die Gr��ten Weltrekorde", in Cologne, Germany, on 23 November 2007. The hammer was switched on. Ryan Stock pulled 3740 lbs (1696.44 kgs) when he pulled a 2002 Audi Quattro 23.9318 feet (6.38 meters) in 20.53 seconds, an impressive feat considering he accomplished this feat with a solid steel sword down his throat! With two chains attached between the vehicle's chassis and the sword's hilt, Ryan swallowed the 43.18 cm/2cm blade down his throat and then pulled the car. He set a new Guinness World Record for "Heavist Vehicle Pulled by a Sword Swallower" as of November 26, 2008. Frank Skerbeck learned sword swallowing in 1859 at the age of 11 and became a legendary circus performer and owner. Edith Clifford learned sword swallowing in 1899 at the age of 13 from legendary Barnum and Bailey Circus sword swallower Delno Fritz. Rick Dennis learned sword swallowing at the age of 13 while working with circuses and sideshows around the US in 1966. Haley Hall learned sword swallowing on Oct 7, 2012 at the age of 14 years, 4 months and 28 days in Covington Georgia, and holds the current record for World's Youngest Sword Swallower. Hall performed at Ripley's St. Augustine on February 22, 2014 for World Sword Swallower's Day 2014, on America's Got Talent 2014 and the Steve Harvey Show in 2014, and for World Sword Swallower's Day 2015 at Ripley's Orlando, and on World Sword Swallower's Day 2017 at Ripley's Myrtle Beach SC. NOTE: Due to the extremely dangerous nature of sword swallowing and the number of deaths incurred, the category "World's Youngest Sword Swallower" is CLOSED by SSAI and Guinness World Records™ to minimize the chance of injuries and death in minors. Alex Zander Morrow swallowed his first sword at the age of 14 August 30, 2003 before an audience of other sword swallowers, circus sideshow historians, and international media at the 2003 Sword Swallowers Convention and Sideshow Gathering in Wilkes-Barre, PA USA. The event was captured on film on the documentary "Stomachs of Steel" that aired on The Discovery Channel. Haley Hall swallowed her first sword at the age of 14 years, 4 months and 28 days in Covington Georgia on October 7, 2012. Sasha Ashley swallowed her first sword at the age of 14 in Georgia in 2014. Russia/Sweden 14 years old Jewels Jewels was born in Russia, started swallowing swords in Sweden at the age of 14, and moved to perform in England at the age of 17. UK 16 years old Amy Saunders Amy Saunders started swallowing swords in England at the age of 16. Mexico 18 years old Andrei Saffioti By learning sword swallowing at the age of 18 in 2010, Andrei Saffioti was known as the youngest sword swallower in Mexico. Rhea Roma Jim Lucky Ball II learned sword swallowing in 1948 at the age of 12 from his mother, Estelline Pike and his father Lucky Ball, and is still doing public sword swallowing shows in 2018. Johnny Meah learned sword swallowing in 1957, and is still sword swallowing today. Count Desmond learned sword swallowing in 1956. Red Stuart learned sword swallowing in 1966 from Toni Del Rio and is still sword swallowing today. 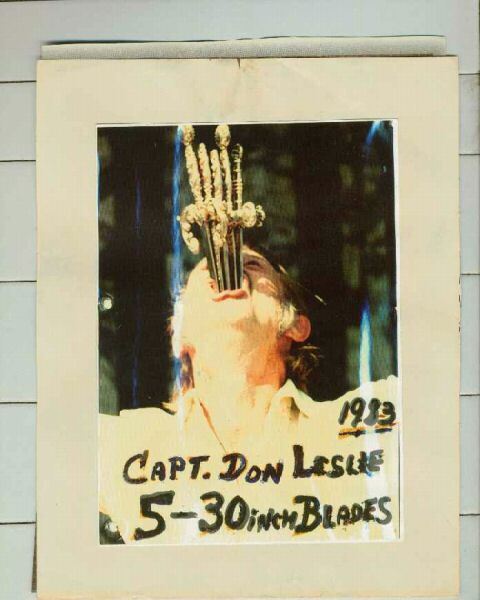 Rick Dennis learned sword swallowing in 1966. Jan Refne Borge of Norway learned sword swallowing at the age of 13 in 1966-67 and is still sword swallowing today. Dale Pritchard learned sword swallowing from Count Desmond in 1975. Ramesh Chandra Kasera learned sword swallowing at the age of 21 in India in 1976. Rhea Roma learned sword swallowing from Count Desmond in 1977. Oldest living sword swallowers by age, year started sword swallowing, and country. 1 Steel Sword Aerial Manx Aerial Manx holds the world record for being the first to swallow 2 individual 2000-volt neon tubes with a 47cm steel sword wedged between them in Newport Melbourne Australia on May 3, 2011. Sword Swallowing Australia Longest Time Michele White Michele White of Victoria, Australia swallowed a sword and retained it in her throat for a period of 225 seconds, or 3:45 (3 minutes, :45 seconds). Ted Campbell Keith Nelson and IJA silver- and gold-medalist Bill Berry passed 6 juggling clubs between them while swallowing 2 swords at the 2002 SSAI Sword Swallowers Convention in Wilkes-Barre, PA USA. Franz Huber Franz Huber from Garching an der Alz, Bavaria Germany set the world record for knocking down 14 bowling pins with 3 bowling balls while sword swallowing with 45 cm (17.72 inch) sword inside for :35 seconds on March 19, 2014 at SKC Garching an der Alz in Garching an der Alz in Bavaria, Germany. (video) This record was certified as a Record Setter World Record. 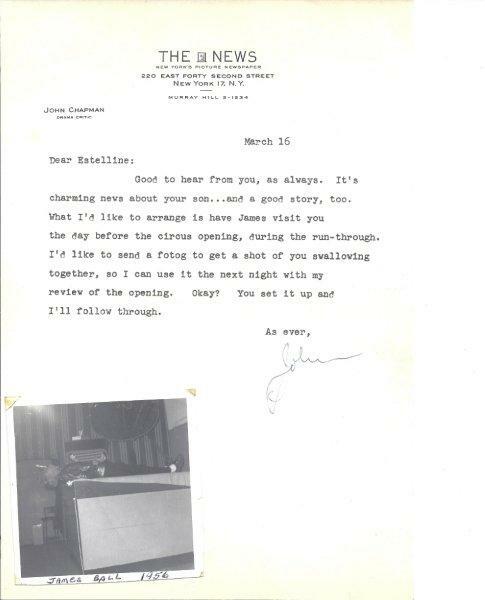 While Laying Down While Laying Down Jim Lucky Ball II Jim Lucky Ball II swallowed swords while laying down on the bally stage in 1956. On Bed of Nails While Laying on a Bed of Nails Andrew Stanton Andrew Stanton of Las Vegas, NV lays on his chest on a bed of nails and grabs his ankles while swallowing a sword. Sword Swallowing 17 seconds "Manx" James Loughron Aerial Manx (James Loughron) of Australia performed a handstand for 17 seconds while swallowing a sword in 2010. While Sword Swallowing World's First Aerial Walkover While Sword Swallowing "Manx" James Loughron Aerial Manx (James Loughron) of Australia performed the world's first aeriall walkover while swallowing a sword in 2010. World's First Sword Swallow while Balancing Upside Down in a Hand-to-Hand Handstand Worlds First Sword Swallow while Balancing Upside Down in a Hand-to-hand Handstand "Manx" James Loughron Aerial Manx (James Loughron) performed the world's first sword swallow while being balanced in a handstand on the hands of Hemlock Merjarne in Australia in 2010. On Unicycle While Jumping Rope on Unicycle Joey Joey Joey Joey of New York performs an act in which he swallows a sword, mounts his unicycle with the sword inside him, and then jumps rope all at the same time. (USA) Dan Meyer Dan Meyer swallowed a 19 inch sword to the hilt while hanging suspended upside down from a trapeze while wearing suspension boots on September 19, 2005 in Hartselle, AL. (Finland) Jari Tapanainen Jari Tapanainen swallowed a 50 cm sword to the hilt while hanging suspended upside down for the Enn�tystehdas TV program in Finland. It was filmed on 10 October 2006 and aired on 5.11.2006. (UK) Helmut Kirchmeier Helmut Kirchmeier swallowed a sword while hanging suspended upside down on February 28, 2009 for World Sword Swallower's Day 2009 while on tour with with the Circus of Horrors in Brecon, Wales, UK. The feat was featured in the April 2009 edition of Bizarre Magazine. While Suspended Over Niagara Falls Count Desmond Count Desmond swallowed a sword while suspended upside down from a helicopter 200 feet over Niagara Falls on Friday, June 13, 1980. Nick Penney Nick Penney performed 3 pushups while swallowing a sword with a blade length of 16.5 inches on June 11, 2012 in Augusta, Maine, USA. Baroness Mischa Michele White swallowed a 21 inch long sword and performed 7 pushups on February 4, 2015 in Victoria, Australia. Dan Meyer swallowed a 21.5 inch long sword with 16.5 inch long blade and performed 21 pushups on February 18, 2015 in Tampa Florida, USA in honor of World Sword Swallower's Day 2015. (video) This record was certified as a world record by Record Setter World Records. Franz Huber Franz Huber swallowed a sword measuring 23.5 inches with blade length of 17.5 inches and performed 10 situps on May 25, 2015 in Garching an der Alz, Bavaria, Germany. (video) This record was certified as a world record by Record Setter World Records. (Australia) Underwater Matthew Henshaw Matty Blade of Australia claimed to have swallowed a sword underwater in a private swimming pool at a private party in North Perth Western Australia on on January 1, 2004. No photos or other verifiable proof available. 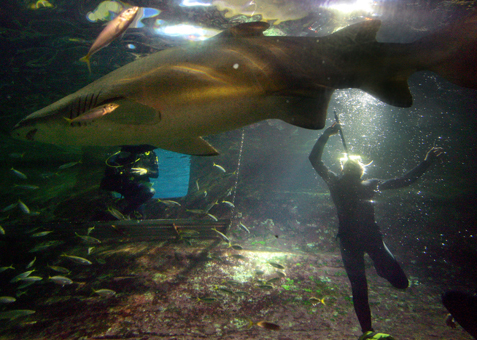 (Australia) Underwater in a Tank of Sharks Chayne Hultgren Chayne Hultgren, the Space Cowboy of Australia was the first person to publicly swallow a sword underwater in a tank of live sharks before the press on May 9, 2006 at Manly Ocean World Aquarium in Sydney Australia. Male (USA) USA Andrew Stanton Andrew Stanton of SwingShift Sideshow was the first person in the US to swallow a sword while suspended by body hooks on Friday, October 17, 2003 outside of Studio 21 Tattoo in Las Vegas, Nevada. (UK) UK Helmut Kirchmeier Helmut Kirchmeier was the first person in the UK to swallow a sword while suspended by body hooks in 2009. (Mexico) Mexico Ricardo Chavoya Ricardo Chavoya was the first person in Mexico to swallow a sword while suspended by body hooks on December 31, 2010. (Australia) Australia Aerial Manx Aerial Manx was the first person on record in Australia to swallow a 47 cm long sword while suspended by 2 shark hooks with two pyrotechnics strapped to the hilt at 1:00am on May 29, 2011. We are constantly seeking more detailed information, confirmation and verification to confirm and verify all records, both unofficial personal records and official world records certified by SSAI, Guinness World Records, Record Setters, Record Holders Republic, Assist World Records, and others. If you have verifiable proof or additional information to collaborate, confirm or correct record information, please contact us. Please note that all records set must be verifiable, measurable and breakable (ie, with measurable statistics capable of being broken by someone else). This means record attempts must include statistics such as dates, times, distances, lengths, measurements, and other verifiable measurable statistics that may be plausibly broken by someone else. Just claiming to be the "first" to swallow a sword while doing something else, for example, "riding a bicycle", "wearing plaid pajamas", "climbing a ladder", "sliding down a waterslide", or "jumping 100 times on one foot" even though it may be a unique stunt, is not in and of itself considered a viable breakable record because someone else can not go back in time to beat your claim of being the first. * Note: Due to the dangers related to swordswallowing, the Guinness World Records™ retired the category of sword swallowing in 1980 after American sword swallower (Count Desmond) nearly choked to death in his attempt to swallow 13 swords at once. 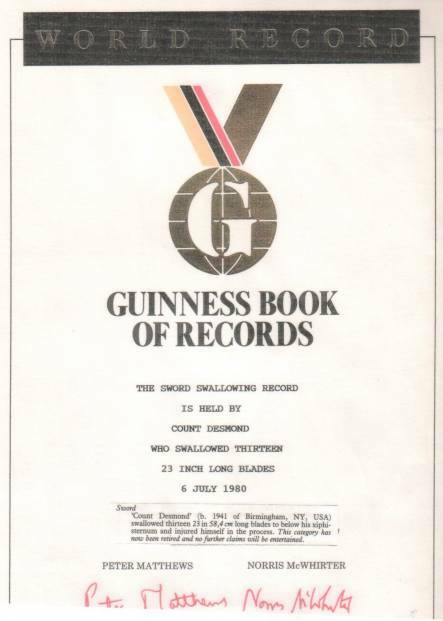 The category was reopened sporadically between 1980 and 2000; however, the 2001 edition of the Guinness Book of World Records™ contained no mention of sword swallowing whatsoever. As of February 2005, Guinness has again begun recognizing and certifying sword swallowing records that are verified by the Sword Swallowers Association Int'l.